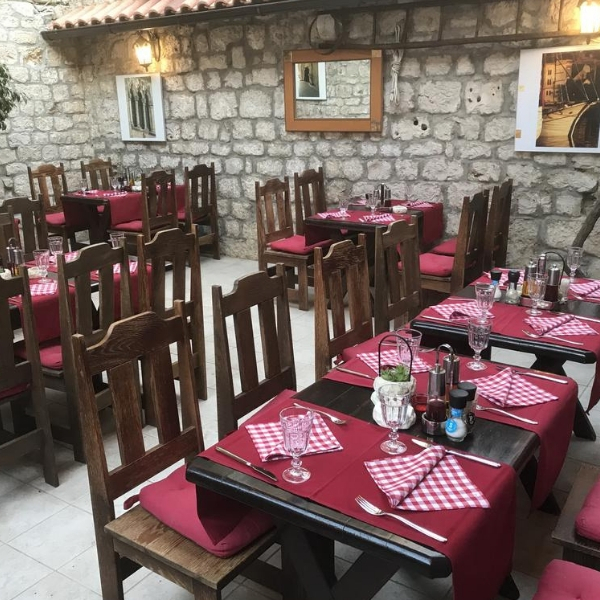 Book your holiday in Croatia at the charming Hotel Tragos a 3 star property situated within an 18th century palace, in the city square of medieval Trogir. The hotel building is in the UNESCO World Heritage site and is conveniently located for shopping, cultural entertainment and activity excursions in the area. 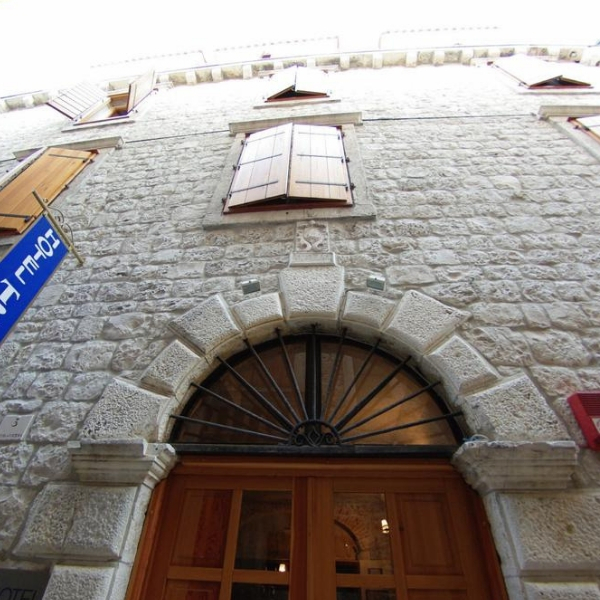 The 3 star, family run Hotel Tragos boasts a prime position in the heart of Trogir town centre. Only 20 yards from the city square, the Pjaca, and the famous St. Lawrence cathedral, this charming boutique hotel is perfect for holidaymakers wishing to explore the many cultural sights of interest in the local area and surrounding region. Trogir has many quaint cobbled streets and a leisurely stroll can take you directly to the marina. There are plenty of shops, cafes, bars and restaurants to visit and enjoy along the way. If you want to wander further afield excursions and day trips to neighboring islands Vis, Hvar and Brac can be easily arranged. The hotel has 12 comfortable and modern guest rooms that are fully air conditioned and well equipped with everything required for your relaxing holiday to Croatia. 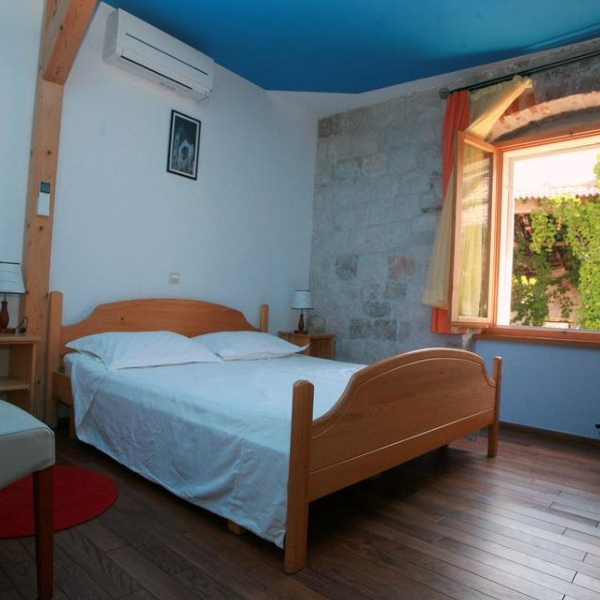 Pleasant views of the hotel garden and Trogir rooftops can be enjoyed from the rooms. 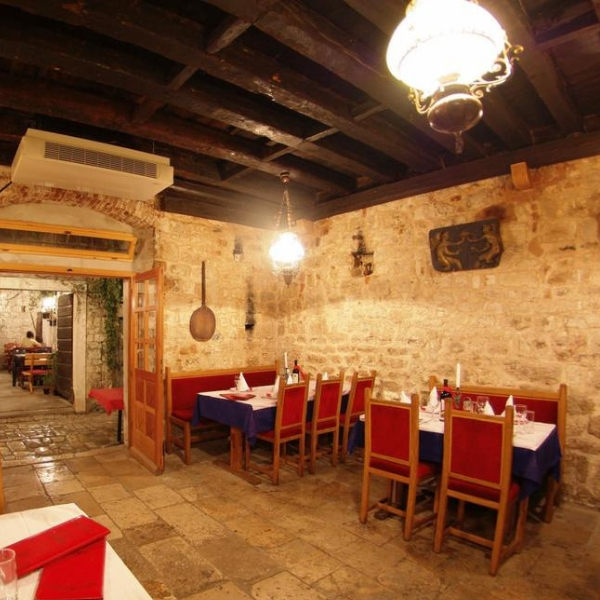 On-site hotel guests can enjoy traditional Croatian hospitality and classic Dalmatian cuisine in the restaurant. The restaurant is situated in a renovated wine cellar and features exposed brickwork, wooden beams and a cosy atmosphere. There is also a charming outdoor restaurant area, situated across the hotel’s cobbled path. The open-air restaurant has a private and intimate seating area that is surrounded by ancient walls and fragrant climbing roses.